Sophie says..: Banish the bacteria - The perfect cosmetic organiser for all your essentials! Banish the bacteria - The perfect cosmetic organiser for all your essentials! Ever since I read a post from Holly Arabella highlighting the amount of bacteria that can be lurking in your make-up bag, i've been searching for suitable compact storage for my essential products. As I am constantly shifting between Southampton and Bournemouth i've got into a habit of keeping all my makeup in various bags and just taking them out when I need them. So after an extensive search I managed to find a brand of cosmetic organisers that don't break the bank. They're called Glam and are found on Amazon, and they sell a range of cosmetic organisers in all different shapes and sizes. The organisers are made of clear acrylic resulting in easy location of products if you happen to purchase one of their 'four drawer' chests. A narrow compartment for extra storage. It easily fits all my essentials in it, and more! As you can see i've combined my lipstick compartments with my liquid eyeliner and lip stains etc, as I don't have a lot of lipsticks. They are also tiered so I can easily see all of the products. The back compartment holds my blush and foundation perfectly, with the two narrow compartments fitting my makeup brushes and mascaras in without any problems. This is the perfect addition to any make-up lovers bedroom or bathroom, and it will probably reduce the amount of time I spent putting on my make-up as everything is clearly laid out right infront of me! I'll definately be investing in larger units from Glam for the rest of my products, and i'm looking into finding a nice nail polish display rack also. 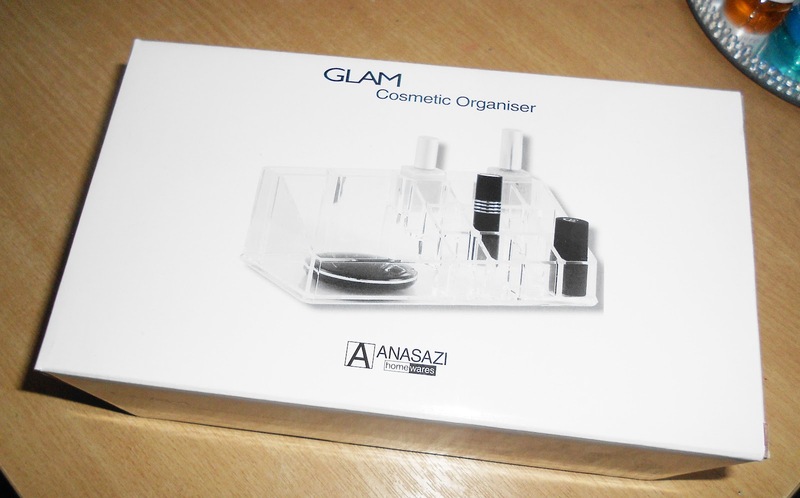 The Glam Cosmetic Organiser retails at £13.50 and can be purchased here. Make sure you check out the rest of the organisers too, they have corner organisers and smaller organisers just for your makeup brushes. I am so happy with this purchase, and I know you will be too! What a fabulous organiser, thats perfect! Great price too.